2. In the circuit shown, D1, D2 and D3 are ideal and inputs E1, E2 and E3 are 0 volts for logic’0’ and 10 volts for logic ‘1’. What logic gate does the circuit represent? 3. A universal gate can implement any Boolean function by connecting sufficient number of them appropriately. Three gates are shown. 9. 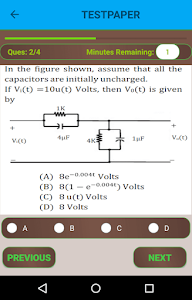 A 3 input majority gate is defined by the logic function M(a,b,c) = ab + bc + ca. Which one of the following gate is represented by the function M(M’(a,b,c),M(a,b,c’),c)? 14. In an 8085 microprocessor, which one of the following instructions changes the content of the accumulator? 15. A function of Boolean variables X,Y and Z is expressed in terms of the min-terms as F(X,Y,Z) = ∑m(1,2,5,6,7). Which one of the product of sums given below is equal to the given function? 17. Problem on Design of 1 to 8 De-multiplexer using two 2 to 4 decoders with extra logic gates. 10. If the circuit shown has to function as a clamping circuit, then which one of the following conditions should be satisfied for the sinusoidal signal of period T?